The morning after the Washington Post published a story claiming that Russians were responsible for cyber-intrusions into the business systems of American energy companies, Donald Trump addressed the cyber. He has a plan. 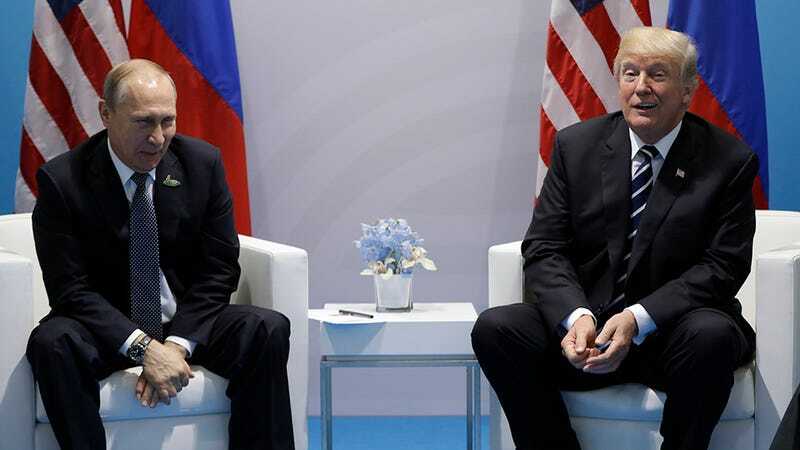 “Putin & I discussed forming an impenetrable Cyber Security unit so that election hacking, & many other negative things, will be guarded,” Trump tweeted. Minds were blown. This is a strategy that no one had considered. Who could imagine that the solution to Russia’s hacking and interference in the 2016 election would be solved by just partnering up with Russia to tighten our(?) cybersecurity? According to Former Secretary of Defense Ash Carter, the Russians would have thought of that. Speaking on CNN’s State of the Union explained that this is standard Moscow procedure: Deny, ask for American intelligence as proof, then propose a working group. Putin was less direct in his account of the meeting. According to the New York Times, he said that he “got the impression that my answers satisfied him.” When asked repeatedly if Trump believed Russia’s denials of hacking, he simply said they’d have to ask the American president. When Putin’s spokesperson, Dmitri S. Peskov, was asked about the difference between Tillerson and Lavrov’s characterizations of the meeting, Peskov said, “Believe Lavrov.” The president has not disputed the Russian Foreign Minister’s version of the meeting. Trump’s Sunday morning tweets are the most substantial account of the meeting from the president that we’ve received yet. And since the White House has said that Trump’s tweets are official statements, I guess we have to take them seriously. We’re really doing this. We’re going to create some sort of joint cyber unit with Russia that will prevent them from hacking. Appearing on ABC’s This Week on Sunday, Treasury Secretary Steve Mnuchin praised the idea. “What we want to make sure is that we coordinate with Russia, that we’re focused on cybersecurity together, that we make sure that they never interfere in any democratic elections or conduct any cybersecurity.” That was the end of the sentence. We want to coordinate with Russia and make sure they don’t conduct any cybersecurity. Former Trump Campaign Manager and current informal White House advisor Corey Lewandowski appeared on Fox News on Saturday and gave the best indication of what’s going on here. “What we saw yesterday and what’s been reported yesterday is that the president took this issue directly to Vladimir Putin, questioned him if they were involved in meddling in the elections in any way, shape, or form, and from what we are hearing, the Russians have denied this,” he said. “I don’t know what else the mainstream media can talk about other than the fact that there was no collusion,” said Lewandowski. “There was no coordination. Now, the president is taking this issue directly to the president of Russia and raised it so now I think the issue is officially dead.” Putin says he didn’t do it. So, that’s true. And there’s no possible coordination between the campaign and Russia because Putin didn’t do it. Trump has repeatedly indicated that he thinks he can just make this whole issue go away through sheer will. The most prominent example is when he fired FBI Director James Comey and reportedly told the Russian Ambassador in a private meeting, “I faced great pressure because of Russia. That’s taken off.” It wasn’t. Trump did land himself under investigation for obstruction of justice, though. Republicans were furious with Trump this morning. Senator Marco Rubio tweeted “Partnering with Putin on a “Cyber Security Unit” is akin to partnering with Assad on a ‘Chemical Weapons Unit’.” And speaking on Meet the Press, Lindsay Graham said that working with Russia on cybersecurity is “dumbest idea I’ve ever heard.” But Graham also said, “He understands the world pretty damn well except for Russia... I just don’t get it.” The stupidity is infecting everyone. If you need some sort of reassurance that Trump is just a moron and definitely not a Russian spy, consider one of his subsequent tweets. “Sanctions were not discussed at my meeting with President Putin,” he wrote. “Nothing will be done until the Ukrainian & Syrian problems are solved!” Considering there aren’t any sanctions on Russia that are tied to Syria, Trump just raised the stakes on what the US is demanding from the Kremlin. "You know, this Russia thing with Trump and Russia is a made-up story."